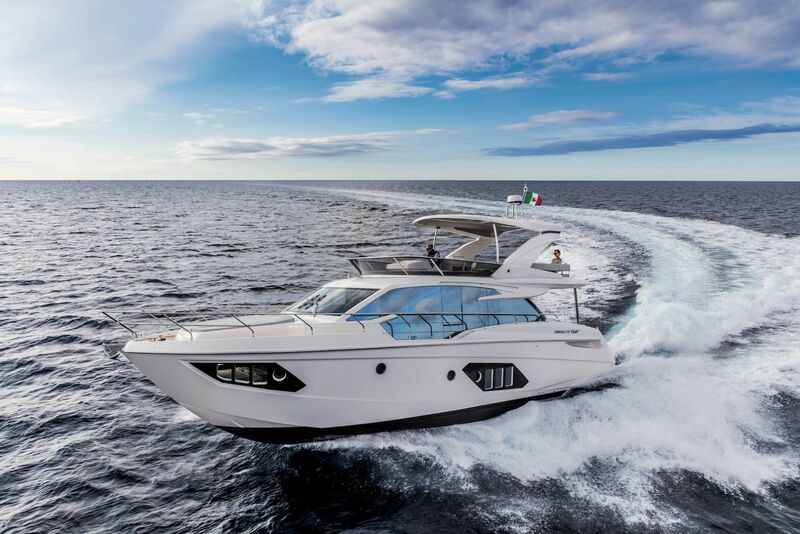 A fresh approach to luxury boating with a combination of user-friendliness, functionality and Italian fashion has proven attractive on the Absolute 52 Flybridge Yacht. 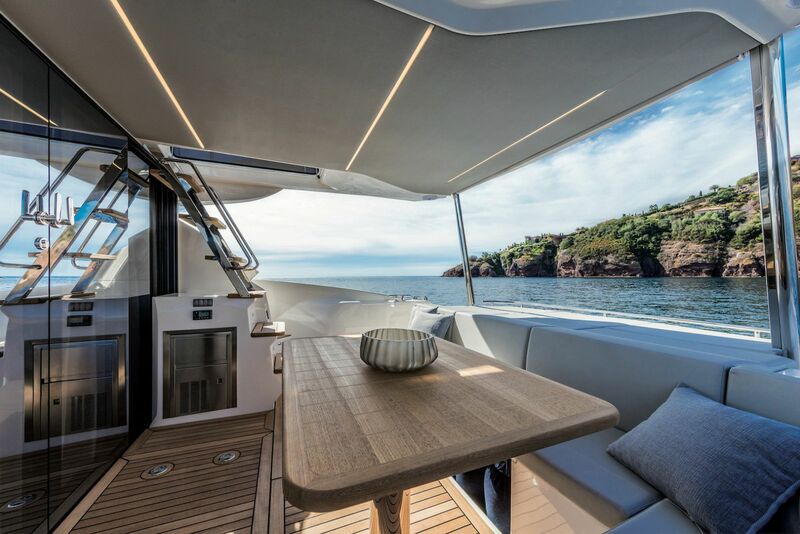 If you’ve ever visited a boat show you’ll notice a grand and majestic fleet of Absolute Yachts and it’s grandstand along the dock is a sign of the great success the Italian shipyard is obtaining all around the world. 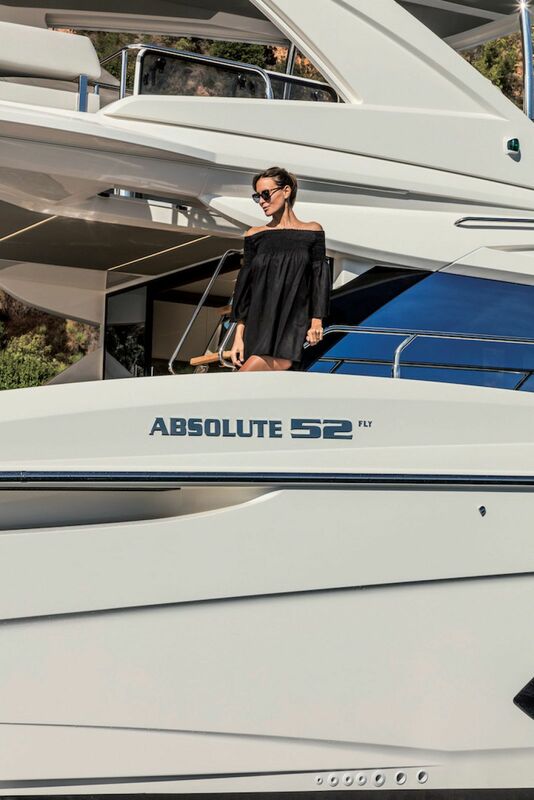 Nothing has been left to chance in Absolute’s 52 FLY. It’s design and ergonomics perfectly merge together. 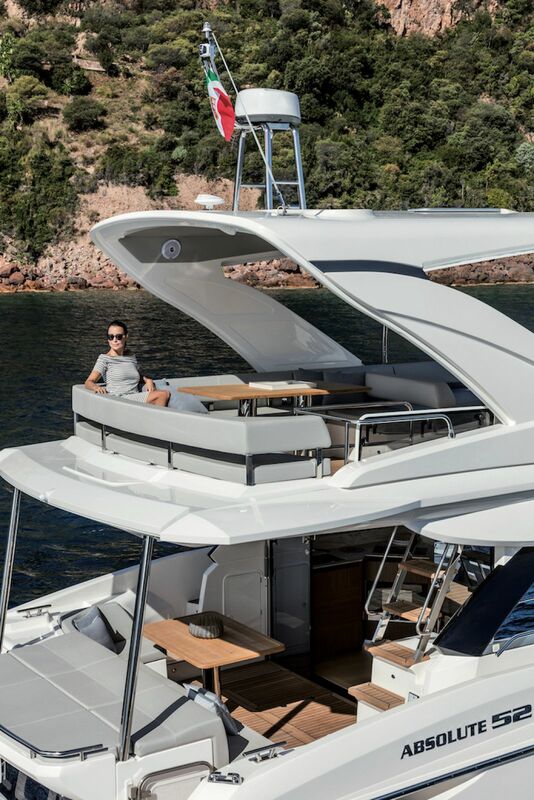 The 52 FLY is arranged with as much volume as that one of a 60 footer, especially considering the boat is equipped with a hardtop which creates a true additional living area on the bridge. 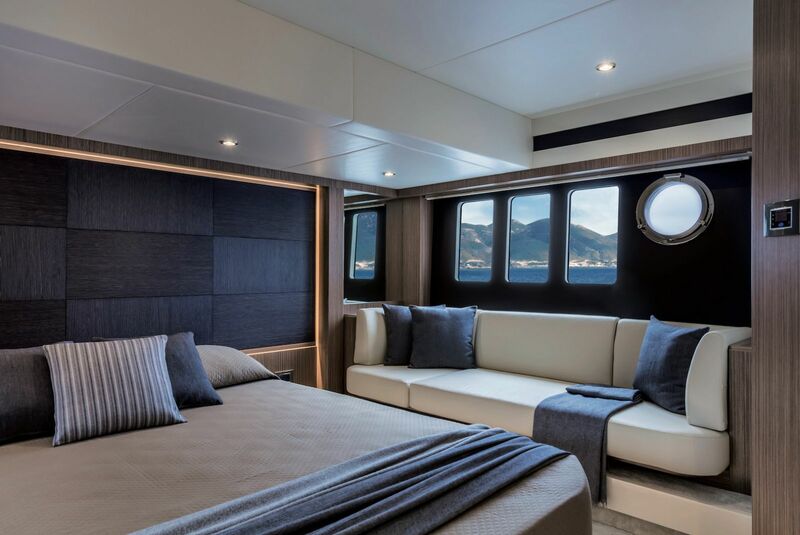 Once onboard the 52 envelopes you with its vast entertaining spaces, several indoor and outdoor seating areas, oversized glass framing the ocean views, aft galley, and three staterooms with two heads. The fit and finish is extremely high-quality: woodwork, hardware, lighting and systems have all been built with extreme care in order to ensure a perfect mix of luxury and consistency that significantly impresses boaters. At the boat’s transom chose from a lazarette, fitted for holding water toys, or a crew quarters. The must-have starboard side salon door off the lower helm is a real perk. It provides immediate access to the walk-around side deck while docking allowing you to handle the joystick with one hand and your eyes fixed solely on the platform. A cockpit camera with stern-view display on the nav screen from the forward helm is also quite a pleasure. LED lighting fitted along both the side decks and bed headboards, impressive AV systems with a BOSE home entertainment system and retractable 40” salon TV. 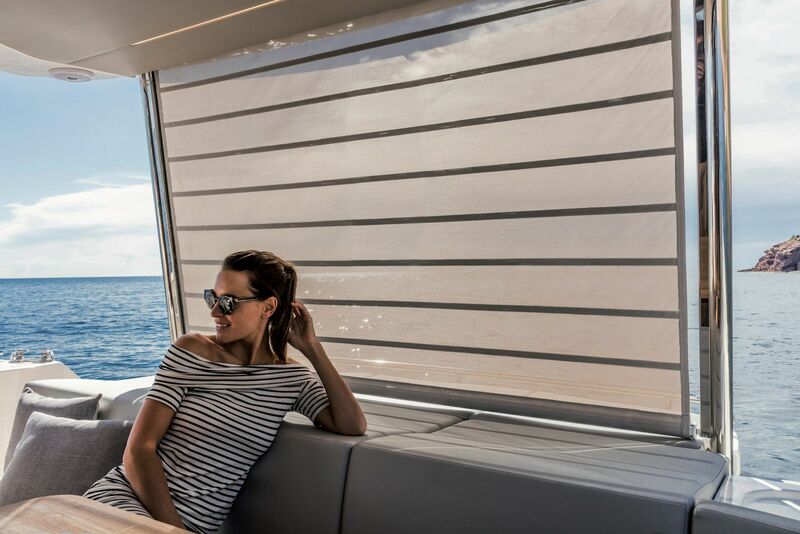 Everything in this area is extremely high-quality: woodworks, hardware, lighting and systems, all chosen and built with extreme care in order to ensure a perfect mix of luxury and consistency that has significantly impressed boaters. 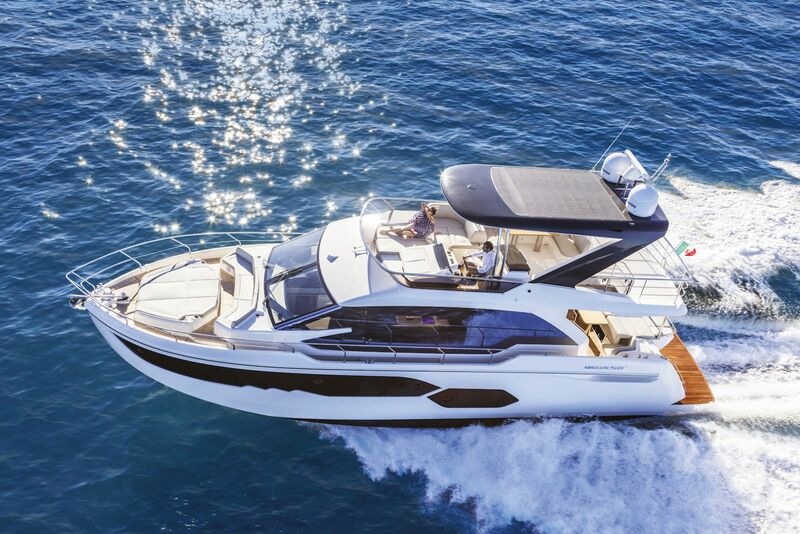 The Absolute 52 FLY is powered by Volvo’s new D8 IPS 700 550hp engines which represents Volvo’s novelty to ensure greater power reducing both emissions and fuel consumption. 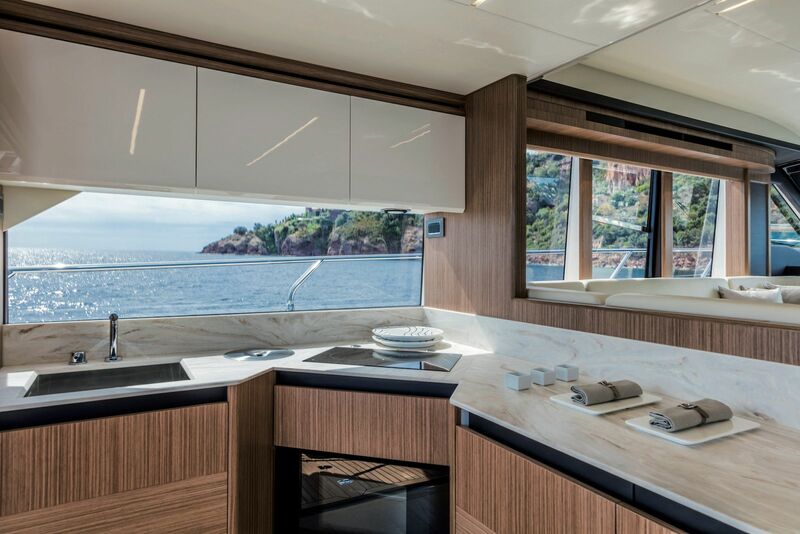 A glazed door gives access to a large open space where the galley is cleverly positioned between the two main environments of the yacht: the cockpit and the lounge. This solution inevitably results into comfortable simple, maneuverability for the host. 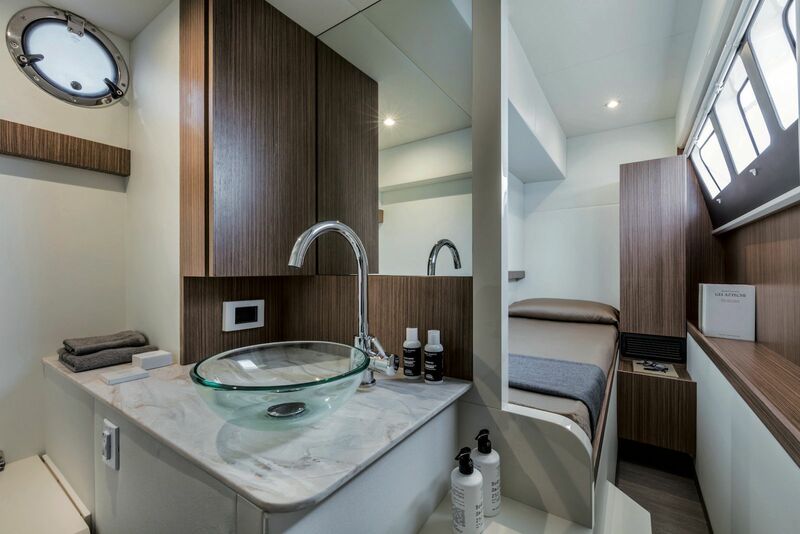 From the galley, the step-up to the salon creates headroom below in the full-beam and third staterooms. 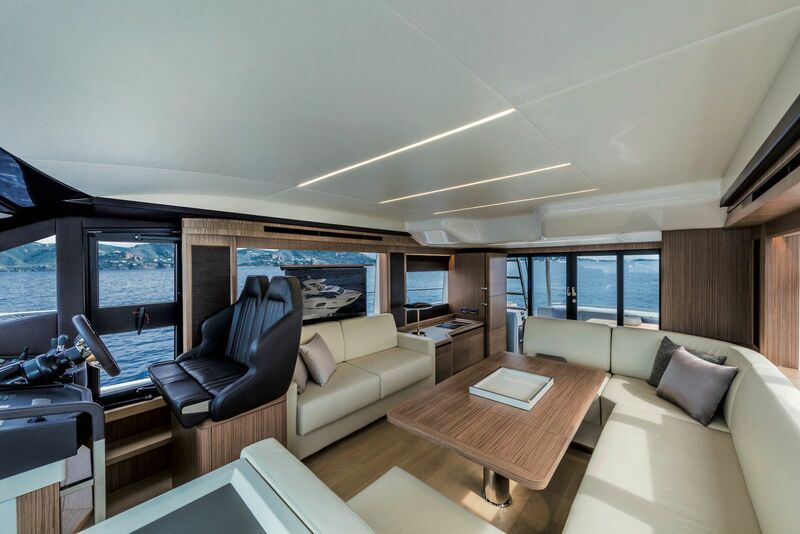 The portside U-shaped lounge surrounds a convertible dinette, opposite is a settee, behind which is a large electric actuated TV. The social salon is made up of a large sofa and a flip-top table reaching a considerable size allowing 6 guests to have lunch comfortably. When the table is closed, the entire area becomes a true sitting room furnished with two sofas where guests will immediately feel at home. The lower helm on the starboard side is perfectly integrated in this environment. The watertight side door is practical and very useful allowing to manage docking maneuvering both quickly and safely. Ergonomics is perfect: everything is at the right place. As you enter the master stateroom it’s hard not to stop to appreciate its volume. With a beam of 14 feet, several large windows and a large leather sofa, walk-in closet, romantic lighting this cabin offers the owner an extraordinary visual impact. Storage onboard is always excellent. 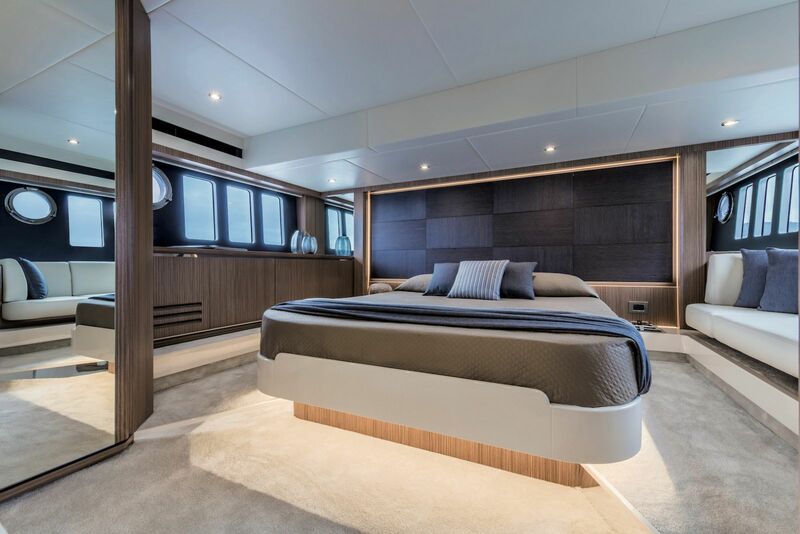 Like the rest of this yacht, the master head is spacious and includes a separate stall shower. 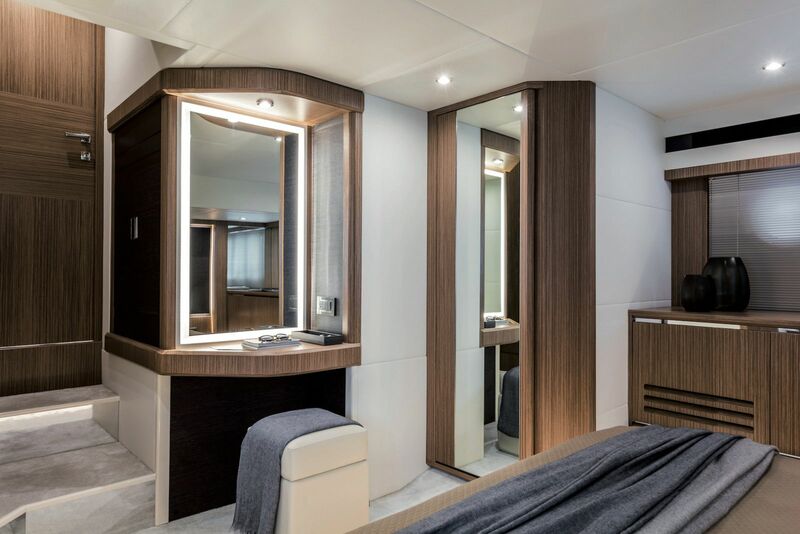 A cabinet equipped with a mirror and a vanity stool emphasizes the exclusivity and refinement of this stateroom. 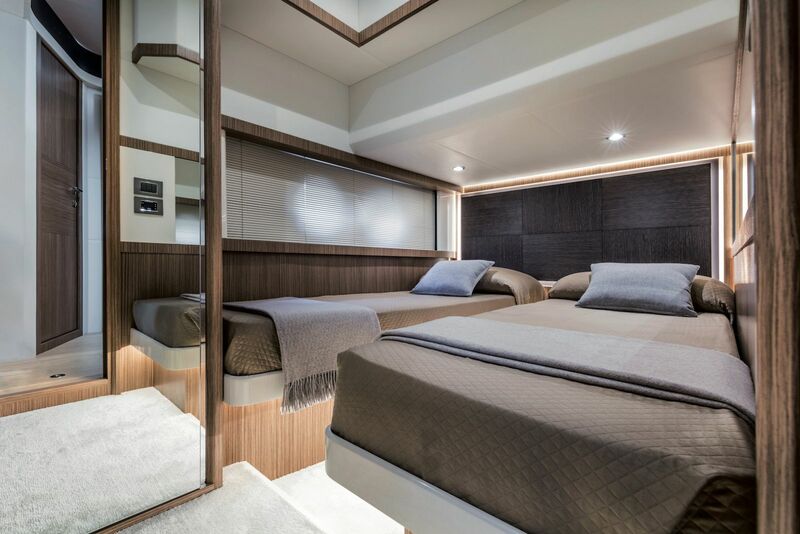 The Absolute 52 FLY has a very generous accommodation plan, in fact, it has one of the most spacious forward VIP cabins in the market. 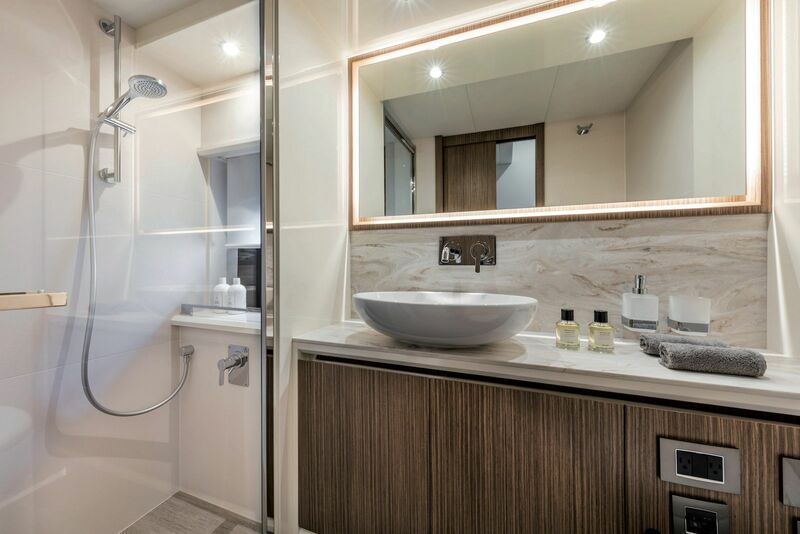 The three-stateroom, two head layout boasts high-quality finishes and upmarket ambience, smart joinery and luxurious bathroom fittings. All the staterooms have opening portholes for fresh air and light. Adult length single beds in the third stateroom are comfortable. 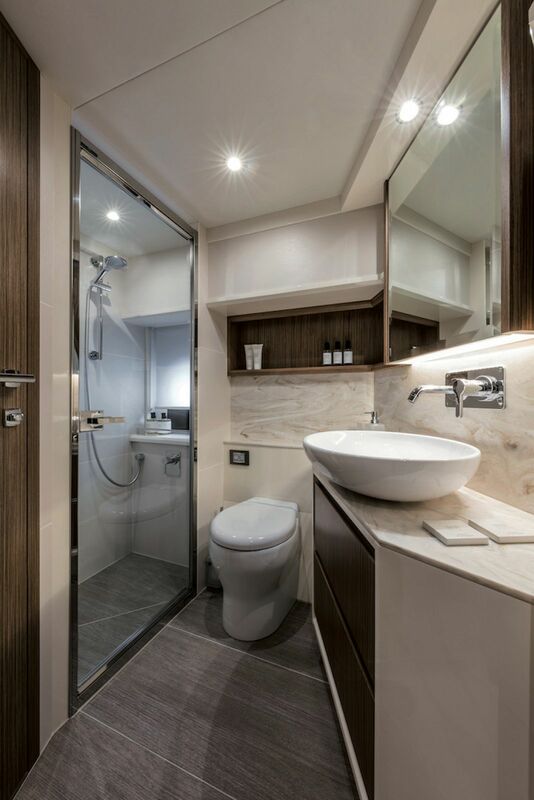 The crew quarters, accessible from the watertight hatch, is equipped with a single berth and is complete with all the amenities. Generous volumes are the dominant element of Absolute Yachts’ exteriors. 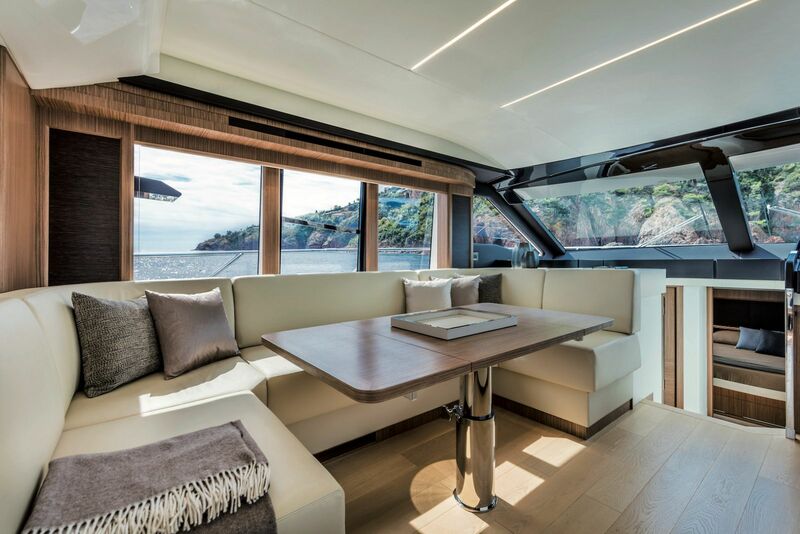 Immediately, especially on the flybridge, covered by a hardtop for 70% of its surface, gives this boat an additional well-illuminated luxury living area. Dine alfresco with a fully equipped wet bar, large dinette and sofa all sheltered by the hardtop shielded from humidity by the cleverly placed halogen spotlights. 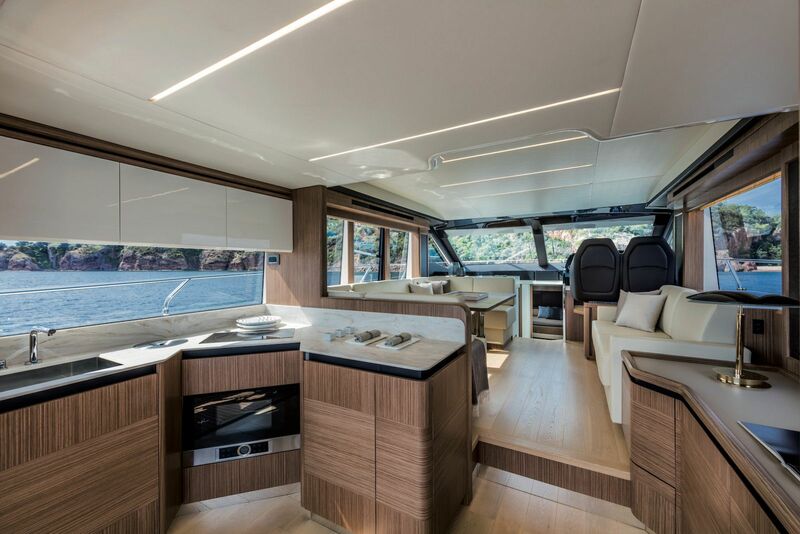 Adjacent to the helm is a second sofa accommodating 6 guests and creating a refined lead into the huge flybridge sunpad. 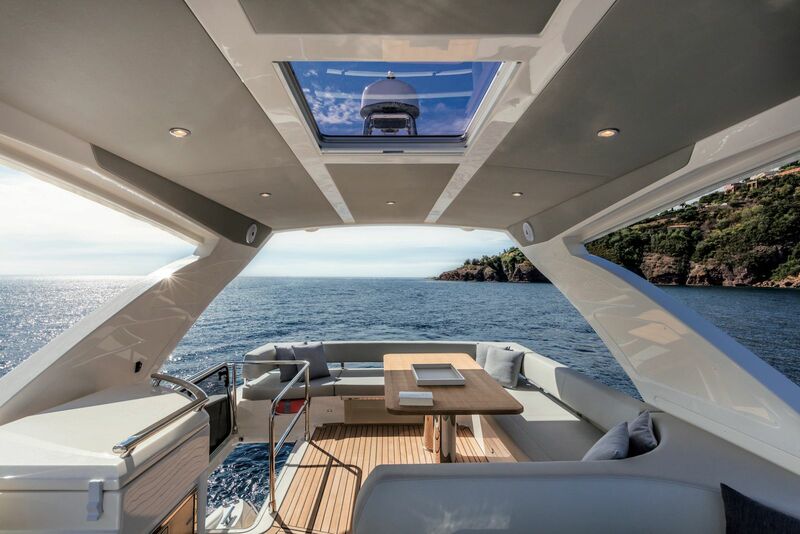 The lower helm, where all the steering and monitoring equipment of the upper deck is replicated, offers excellent visibility in all directions and proper standing head room. 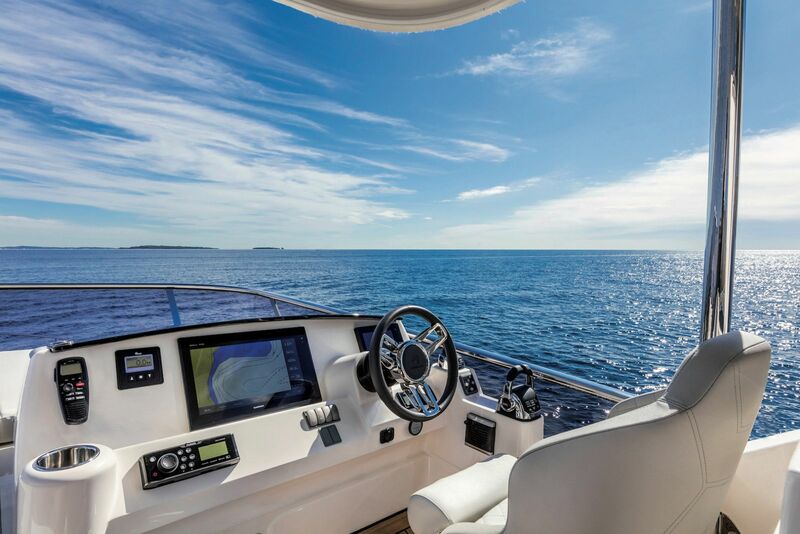 With its perfectly placed Volvo joystick allows even the least experienced Captain to dock easily thanks to the two D8 IPS 700 engines. The maneuverability made possible by this technology are fantastic. 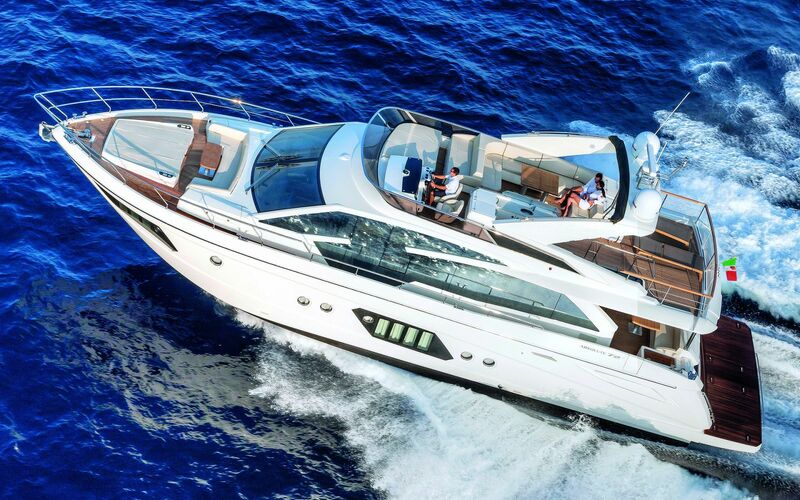 First-class engineering below deck is apparent with an immaculate and well thought-out engine room. The outlets and inlets for the bilge manifold are labelled, there are big clear sea strainers, aluminium fuel tanks with sight gauges, impressive wiring, and terrific battery access. The D6 engines with pods allow for a lot of servicing room. From the cockpit to the bow passages are spacious and well-sheltered both from the gunwale and guard rail. The side deck is furthermore served by a large cleverly-positioned handrail. 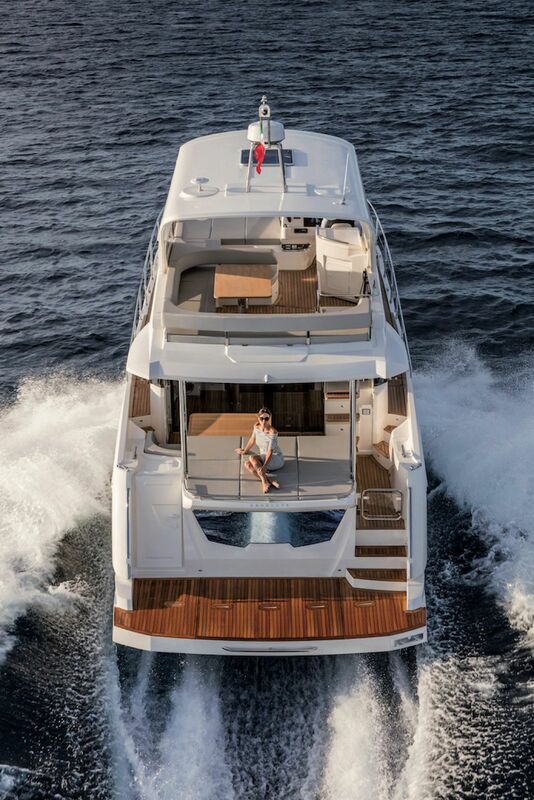 Generally, larger yachts sacrifice this addition in order benefit the interior volume, which is not the case on the 52 FLY. The section on the bow reserved for lines and anchoring is well-arranged and you don’t need to be an acrobat to tie up. The winch is precisely placed, a further sign of the great attention to design this Absolute yacht features. Both on the bow and the stern, there are two sunpads, each of which can accommodate up to 3 people. The aft sunpad is a small masterpiece of nautical engineering, with a partition between the crew cabin and the top of the seats of the cockpit sofa in order to create a third sunpad. 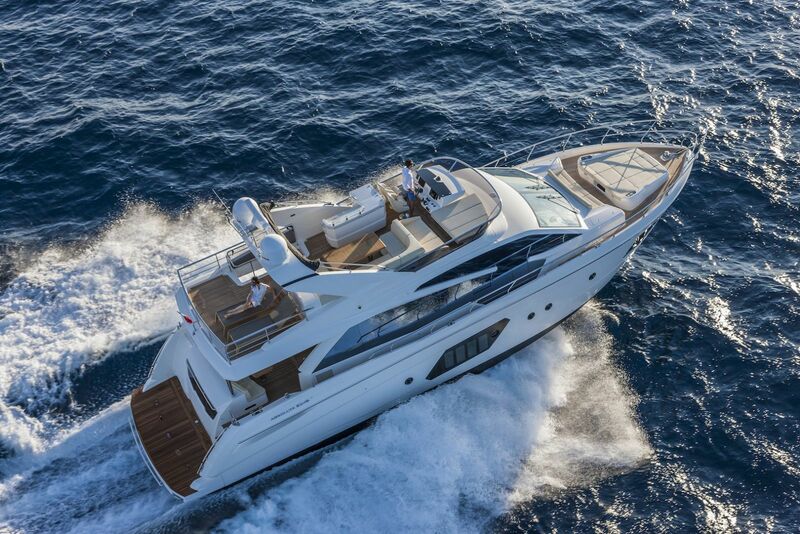 The Absolute 52 has a flowing layout with abundant seating that function as entertaining areas. 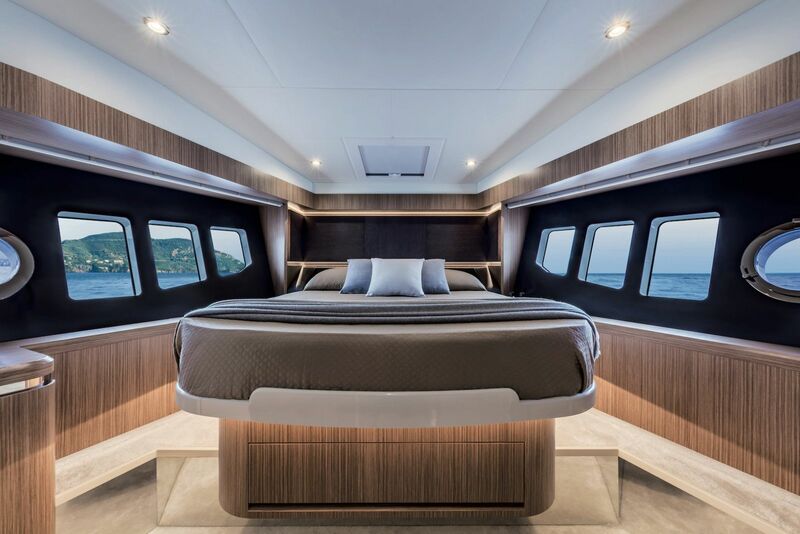 Forward of the helm is one huge sunpad area big enough for an entire family, with two flip-up backrests so a couple can cruise facing forward in virtual open-air chaise lounges. The ladder up to the bridge has a large covering hatch and very solid grab rails that add to the cruising security on the flybridge. The molded bridge overhang is supported by stainless steel posts, casting a desirable amount of shade. Add the cockpit covers and you can create an all-weather enclosure. 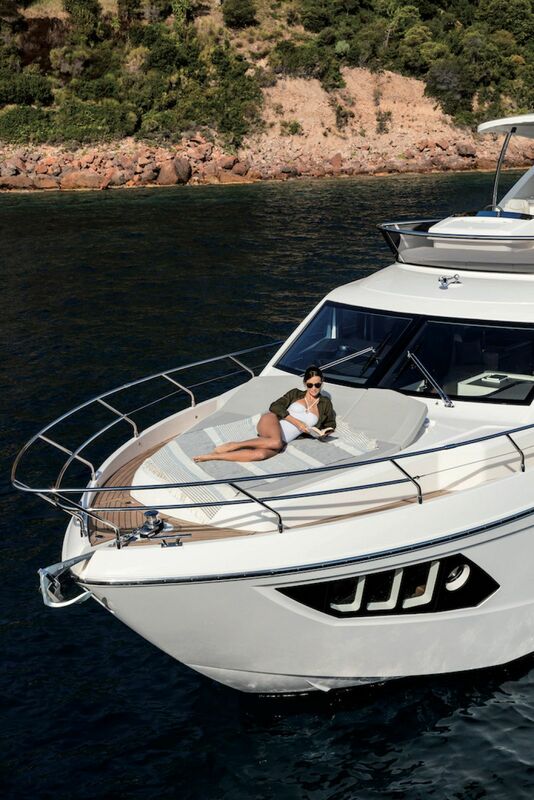 Meanwhile, the large aft sunpad at the transom, on top of the huge and handy lazarette storage off the swim platform, offers another lounging option. There’s a third sunpad on the bow, which underscores the European design and intent of the boat. Thanks to the big lazarette storage area, the cushions are easily stowed. 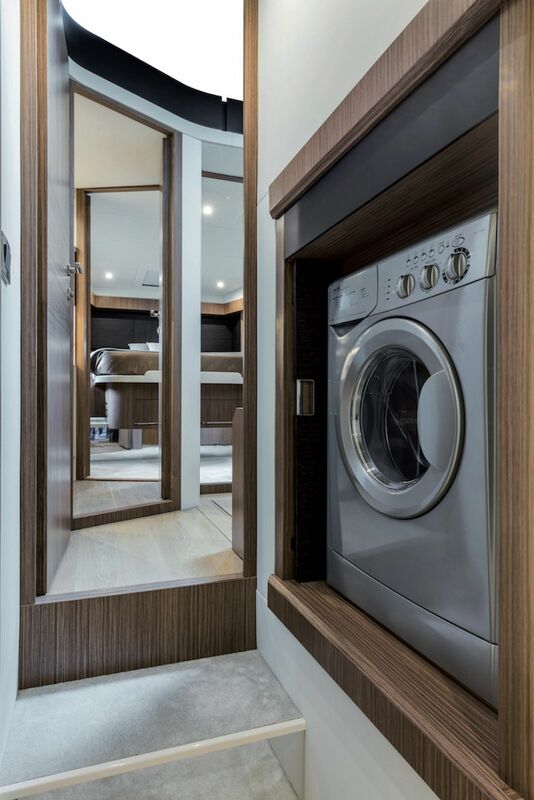 Integrated storage is a feature of the Absolute 52 and the cockpit has molded dedicated fender ‘wells’, built-in storage under the bridge steps, where there’s a second fridge. 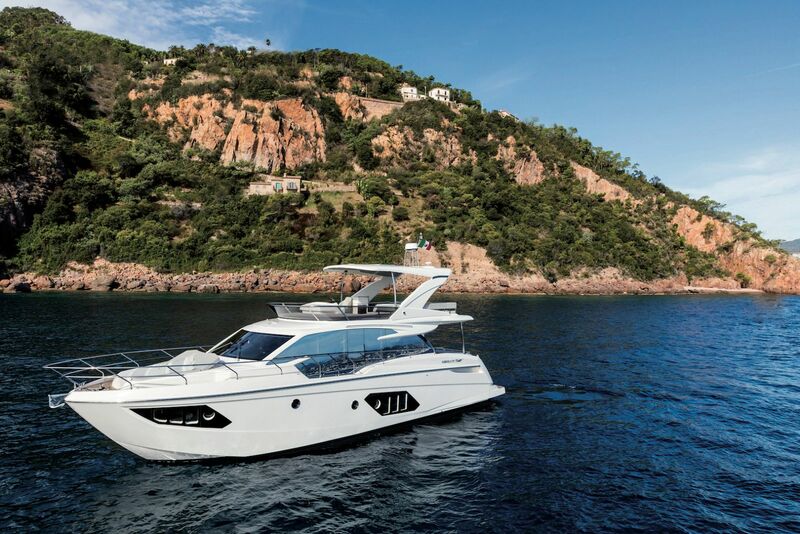 After a restyling in 2017, the new Absolute Yachts 52 Flybridge is ready to take on the world.